The return of fall television brings with it the return of now-familiar discussions about why you should be watching DC’s Legends of Tomorrow. In fact, not only did Entertainment Weekly feature one of these pieces just last week, it did so while interviewing Beebo, the anthropomorphic breakout of Season Three (more on that character later). Legends of Tomorrow is simultaneously a focal point of network (and DC TV) programming and an absolute underdog of a series. At this point, people aren’t tuning out of Legends of Tomorrow because they haven’t heard the good word; it’s hard to call Legends of Tomorrow “underrated” when there are so many pieces telling everyone that Legends of Tomorrow is underrated. It’s actually quite beloved. People have superhero fatigue, though: No matter how many times you try to tell them otherwise, it’s tough to convince viewers that a particular show doesn’t take itself as seriously as the superhero properties that are responsible for said fatigue. The thing about Legends of Tomorrow, though—the thing that makes it fun, and far from self-serious—is that it doesn’t feel like today’s superhero series. It feels like the TV series of yesteryear. The true difference between Legends of Tomorrow and its DC TV companions on The CW is that it’s not trying to rewrite or define the superhero genre within a modern context; instead, it’s going back to the action-adventure series of the ‘80s and ‘90s and recapturing what worked about them. The key to Legends of Tomorrow isn’t that it’s doing something new. It’s that it’s making the old seem new again. In fact, Legends of Tomorrow isn’t just atypical for a DC TV show. It’s atypical for contemporary television. (The closest “mainstream” genre show in recent memory I can compare it to is Starz’s Ash vs. Evil Dead, and going back a little further, USA Network’s “Characters Welcome” shows, like Burn Notice and especially Psych. No wonder Legends of Tomorrow rarely gets its due.) Since Season One—and in a way that’s only improved as the series has become more confident in its strengths and aware of its weaknesses—Legends of Tomorrow has taken its initial premise—the place for the also-rans of the DC TV universe—and transformed it into a fully-functioning, 21st-century version of the first-run syndication series of the 20th. Programs like Xena: Warrior Princess, Hercules: The Legendary Journeys, or even Mutant X, which took larger-than-life concepts, molded them to their not-so-large budgets, and made some pretty memorable television in the process. And any signs of campiness was a part of their charm, which honestly feels like the first rule of Legends. Of course, Legends of Tomorrow has a larger, more 2018 budget than these shows. But it’s still a throwback: Tonally and in terms of execution, the series, which follows a team of misfits with access to time travel, resembles Sliders or Quantum Leap, high-concept episodic TV series that had much more potential for serialization than the industry was ready for at the time. 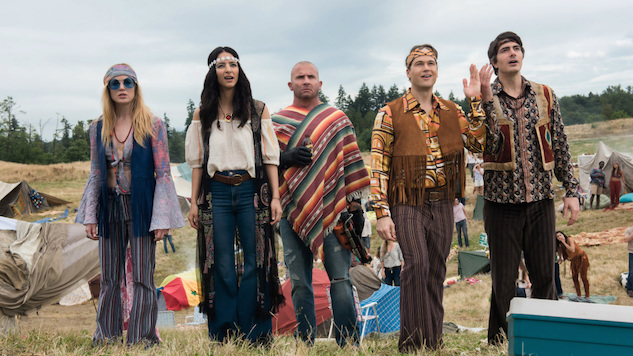 Legends of Tomorrow isn’t anti-serialization or anti-big picture, but it does focus on presenting every episode as a miniature movie-of-the-week that anyone can drop into, which is hard to find in a modern superhero show. The characters are still fighting the Big Bads, but since the first season, no episode has ever been too bogged down in that. I’ve written before that reboots and revivals of this type of TV series could work tremendously with the changes to the dominant storytelling style, and Legends of Tomorrow is essentially an original concept that supports this theory. In fact, going back to the question of “camp,” Legends of Tomorrow’s third season introduced a Tickle Me Elmo-meets-Furby proxy called Beebo, which, through time-travel shenanigans, temporarily became a Viking god (as well as the predominant God) and a fun little runner throughout the season, whether in the form of a character wearing Beebo-themed socks or using a Beebo toy to test a weapon). In the season finale, though—in a scene that really must be seen to be believed—Legends of Tomorrow took that fun little runner and made it the focus of a Voltron-like boss fight (with Beebo representing the Legends). This is certainly a situation where too much of a good thing could lead to a “jump the shark” moment, but on Legends of Tomorrow, the baseline is shark-jumping. Or gorilla-shrinking, as the case may be. But turning the Beebo bit into the linchpin for defeating the Big Bad also combines contemporary serialized storytelling with some good-old-fashioned episodic mischief. And because the Legends of Tomorrow writers have maintained such an old-school misadventure-of-the-week structure, they know how to make it a genuine surprise when that structure ends up being the key to the whole story; the season finale actually features the returns of other, seemingly one-off characters (like Helen of Troy) in roles also integral to the episode’s story and the Legends’ world-saving mission. All of this is absolutely ridiculous and the type of thing you’d expect to see on a television show on in the middle of the day on a Saturday—back during the days of channel-surfing—not on primetime television. Legends of Tomorrow is a superhero show that doesn’t demand to be taken seriously, even though it clearly understands craft and structure and what works about itself in a way the other DC TV shows on the network often struggle with. But for all the reasons I’ve stated, Legends of Tomorrow is also not the type of series that’s going to dominate the pop culture discourse—instead, it will most likely continue to get the consistent, concentrated attention from critics such as myself, who extol its strengths, all while sounding like we’ve been sharing a collective fever dream. That’s not a matter of creative failure: Legends of Tomorrow is perhaps the truest success story of all of the DC TV shows, even though the more serious Black Lightning receives more critical respect. In case you’ve missed Legends of Tomorrow, think about it not as one of the superhero shows you’re burned out on, but instead as an action-adventure episodic that just wants to have fun. That’s how Legends of Tomorrow is written, anyway, even if it’s a cog in a bigger machine. Season Four of DC’s Legends of Tomorrow premieres tonight at 10 p.m. on The CW.